A Big Fat Debate | Health Stand Nutrition Consulting Inc.
Why do we need fat and which is better? Butter or margarine? Olive oil or coconut oil? You might be wondering if it is time for an oil change with all the latest hype about coconut oil. You might also be curious about the current opinion on the lengthy debate about butter versus margarine. 1. Why do we need dietary fat? With so much in the media about eating less fat overall this three-letter word has an overall negative connotation for many people. It is important to note that fat is an essential nutrient. It is necessary for essential fatty acids for our brain and cells in the body. Fat is necessary to help us absorb fat-soluble vitamins such as vitamin A, D, E and K. Fat also makes food tasty, as well as keeps you from getting hungry for a longer time between meals because it is digested slowly. If you do not have enough fat in your diet you will lack satiety in your meals and feel hungry often. 2. Does fat in food get stored as body fat? There is a common misconception I hear from our clients. Just because you eat fat in food does not mean it will get stored as body fat. Consuming an excess of calories greater than your body needs from any nutrient (carbohydrate, protein or fat) will get stored as body fat. Ironically you could eat a diet that is very high in fat (for example consuming large amounts of ice cream) and actually lose weight if the calories you consume are reduced. Note that body fat is also essential and having too little of it is as damaging as having an excessive amount of body fat. Body fat is needed for energy metabolism, keeping us warm and to cushion our organs, feet and other parts of the body to protect against injury. For women having enough body fat is essential for fertility, a healthy pregnancy and providing us with an attractive curvaceous figure. 3. How much dietary fat should we eat per day? The amount of dietary fat you need per day is based on a percentage of total calories. You may have heard in the media that less than 30% of your calories should come from dietary fat – in fact this is an average and there is a range. The following chart suggests the goals for the percentage of total calories recommended from dietary fat based on age. 4. What are the best and worst dietary fats to consume? Unsaturated fats (polyunsaturated and monounsaturated fats) found in vegetable oils such as olive oil, nuts, seeds, avocados and fish are healthy fats that are good for us. Be sure to include a moderate amount of these in your diet, as they lower your “bad” or LDL-cholesterol. One type of polyunsaturated fat known as the omega-3 fats improve heart health by making the blood less sticky, which reduces the risk of heart attack and stroke. Omega-3 fats also lower blood pressure and blood triglyceride levels and are helpful for immune and inflammatory based issues. Omega-3 fats are important for pregnant women for brain and nervous system development of babies. The best sources of omega-3 fats are fatty fish and other sources include ground flax seeds, walnuts and hemp seeds. 5. Which is better butter or margarine? On the other hand vegetarians that do not consume animal foods may choose margarine instead because it is plant based. 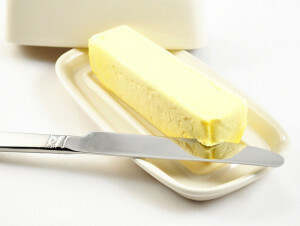 Since soft-tub non-hydrogenated margarine is lower in saturated fat than butter and is trans fat free if you have high cholesterol you might choose this for a nutrition reason. Skip square cubes of margarine and tub hydrogenated margarines since these are high in trans fats. 6. Which is better coconut oil or olive oil? 7. What about dietary cholesterol? Gosh this whole things about eggs and cholesterol is confusing. Are you aware of the study in Canadian Journal of Cardiology titled “Dietary Cholesterol and Egg Yolks…?” I would be interested to hear your take on this study. A recent study by researchers from Western University in London examined the association between the number of egg yolks consumed per week and amount of plaque in the carotid artery, a risk factor for coronary artery disease. The researchers concluded that those at risk for cardiovascular disease should avoid eggs. It is important to keep in mind that this is just one study. Decades of research confirms that the dietary cholesterol in eggs has little effect on blood cholesterol levels in adults. These studies have also looked at people with existing heart disease and eating an egg a day did not increase their risk for cardiovascular disease or stroke either. Your overall diet and the consumption of foods high in saturated and trans fats are much more significant to help reduce risk of cardiovascular disease or stroke. This study published in the journal Athersclerosis surprisingly did not consider or factor in important factors like saturated and trans fat intake, alcohol intake, exercise, waist circumference and HDL (good cholesterol) or LDL (bad cholesterol) levels which are important considerations for cardiovascular health. Research supports an egg a day is healthy. The key to good health is a balanced diet with lots of variety and regular exercise instead of focusing on a single food. There are no Health Canada guidelines that suggest limiting eggs and the Institute of Medicine’s DRI’s (Dietary Reference Intakes) does not list a guideline for limiting dietary cholesterol. It is far more significant to reduce foods rich in trans fats and saturated fats than it is to reduce foods rich in dietary cholesterol.